A suspected drunk driver led Elk Grove Police on a 15-mile pursuit early Sunday morning that included a foot chase and an assault on a K-9 unit. 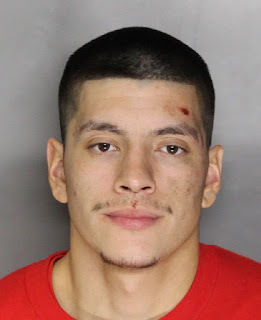 According to Elk Grove Police, 25-year old Andrew Justin Garcia of Elk Grove (pictured above) was observed running a red light near Whitlelock Parkway and Bruceville Road. When a patrol officer attempted to conduct a vehicle stop, Garcia did not yield and led officers on a 15-mile pursuit. The pursuit ended on Bruceville Road near Valley Hi Drive after Garcia crashed his vehicle in the center median. Garcia fled on foot after the collision in an effort to escape and a police K-9 unit was deployed to assist officers in taking him into custody. During the apprehension, Garcia grabbed the muzzle of the police canine and punched the canine in the head two times. Officers were able to overcome Garcia's resistance and he was handcuffed. Garcia was arrested after being medically cleared and is being held at the county jail on a $70,000 bail facing five misdemeanor and two felony charges including drunk driving and assaulting a police dog. Garcia will be arraigned Tuesday afternoon. Sad that the dog didn't bite him in the groin. Dude needs to be spayed. I hope the dog is okay. It would be nice if the dog were to pay a visit to him in his cell! Suprised the dog took 2 punches. I thought dogs were quick to protect themselves. Hand muzzled and punched out by a man inebriated enough (after medical clearance) to be charged with DUI? Hmmmm -- considering we pay dearly for *trained* K9s, perhaps the PD needs to start discussions/negotiations with the trainer/supplier of that particular animal ---.